Ready made in a wide range of flavours, Lee Kum Kee Menu-oriented sauces bring you delicious dishes and save you time in the kitchen. Prepared from honey and garlic, this sauce is ideal for cooking spare ribs and chicken wings. Stir-fry spare ribs in 1 tbsp oil until done. Stir in Lee Kum Kee Sauce for Honey Garlic Spare Ribs and heat through. Ingredients: Sugar, Water, Honey (12%), Soy Sauce (Water, Salt, Soybean, Wheat, Colour (E150a), Glucose-Fructose Syrup), Tomato Paste, Yeast Extract (Yeast Extract, Water, Salt, Sugar), Onion, Salt, Modified Corn Starch, Dehydrated Garlic (0.7%), Acid (E270), Stabiliser (E415) (Soybean, Wheat), Flavour Enhancers (E631, E627). 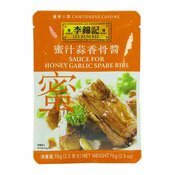 Simply enter your details below and we will send you an e-mail when “Sauce For Honey Garlic Spare Ribs (李錦記蒜蜜香骨醬)” is back in stock!